Very soft and snugly, washed beautifully! Twin-size Dimensions - Flat sheet 66" x 96", Fitted sheet 39" x 75", 1 standard pillowcase 20" x 30" - Fits Mattresses up to 16"
Full-size Dimensions - Flat sheet 81" x 96", Fitted sheet 54" x 75", 2 standard pillowcases 20" x 30" - Fits Mattresses up to 16"
Queen-size Dimensions - Flat sheet 102 X 90, Fitted sheet 80" X 60", 2 pillowcases 20" X 30" - Fits Mattresses up to 16"
King-size Dimensions - Flat sheet 102" x 105", Fitted sheet 78" x 80", 2 King pillowcases 20" x 40" - Fits Mattresses up to 16"
These sheets are beautiful, elegant and soft. When they first arrived I was like they look cheap due to the packing. The plastic bag with the zipper that they use in stores like Walmart and these are suppose to be elegant sheets. But. Once I open the package I was in love. I'm definitely buying more. Well worth it. These sheets are sooooo soft and comfy. I got the dark gray and I love the color. I received these really quick and as usual the service was great. 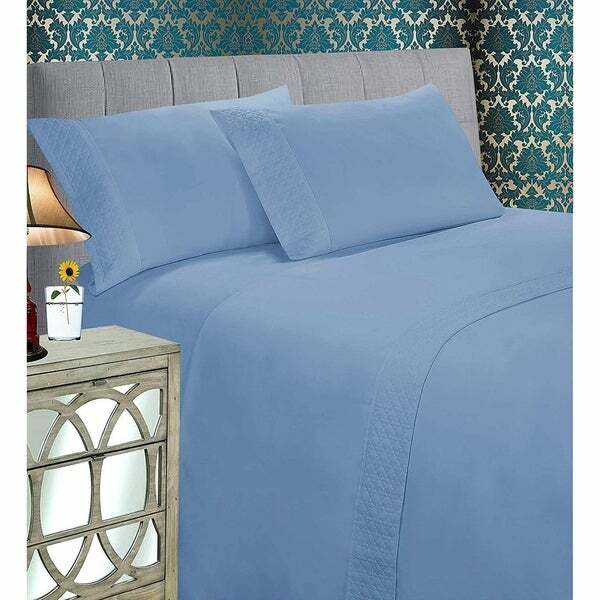 This seems like very soft comfortable sheets for a good price.